Bernie's Dawg Blawg: Dawg Night under the lights! In February the talk, despite a successful class of talented athletes, was that Richt and his staff had missed out on some key recruits, particularly in the state of Georgia. As over 80 of the nation's top (rising senior) recruits descend on Athens this evening for the annual Dawg Night, Richt already has 12 commitments and eight of those are from Georgia. The 2014 class only has room for 10 or so more players. Of course, a lot can happen before next February when a commitment becomes either a signature or a broken promise. But a lot could happen tonight as well. News could come in the form of a commitment, even from a younger 2015 prospect. Dallas Warmack, a junior offensive tackle of Atlanta, is said to be close to making a decision. So is defensive tackle Trenton Thompson of Albany. I'd be a little surprised if Richt didn't end the evening with these two talented big guys on his side of the ledger. Most eyes will be on the 80 or so 2014 prospects though. And Lorenzo Carter of Norcross is arguably the biggest. He's a lean for Muschamp and the Gators. 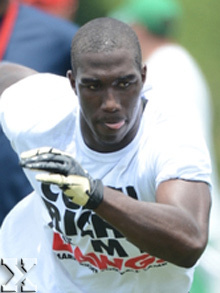 So you can bet Grantham will be in the ear of this five star defensive end. The staff certainly doesn't want to let yet another talented in state prospect like Carter slip away over one of Georgia's borders. Especially from Norcross after losing out to Alvin Kamara on Signing Day in February. Another star to watch will be a wide receiver out of Macon, Shakenneth Williams. He's very proud of his offer from Richt, which he received last month. He too could be waiting for the lights at Sanford Stadium to make things official. After all, he said it was the one offer he was hoping to get. But the real news for Georgia fans continues to be the event itself. Dawg Night has become one of the nation's premier prospect camps and usually gathers some headlines with the number of recruits that make the trip (this year it looks like 300 players will attend, mostly from the state of Georgia) and from the commitments it garners. Richt is certainly pleased with the event's growth. Hopefully he and his staff are smiling even wider later tonight.